Spring comes early and fall lingers late in the Grand Valley. That makes the Grand Junction area a perfect venue for weddings almost any time of year. Add to that its well established wine country offerings, a national monument that might remind you of a mini Grand Canyon, and you have an ideal location for both blatant beauty and a diversity of diversions. Couples can choose anything from small chapels to a major convention center for their big day. The Two Rivers Convention Center is the largest venue available in the area, able to handle 850 for a sit-down dinner – plus a stage and dance floor. It’s an all-weather venue, so if the weather turns very hot or a late-Spring snowstorm creeps up, you’re covered – literally. There’s also ample free parking for guests. Five walkable blocks away, in downtown Grand Junction, is the city’s sister site, the historic Avalon Theatre. The architecturally lovely theater, which underwent a multi-million dollar renovation in 2014, offers unique possibilities for wedding ceremonies and receptions. The renovation includes expanded spaces and a new rooftop terrace. Wedding parties can use aspects of either or both facilities, if needed. Or consider one of the area’s many wineries as your venue. Many have small function spaces. The elegant Two Rivers Winery may be one of the most suitable. This beautifully designed property can handle large groups – up to 225 for a “social set-up” reception, 160 for a sit-down dinner, and has 10 guest rooms, including a spacious bridal suite, that can be folded into a wedding package. They host 35-45 weddings a year and were specifically designed for that, says special events manager Brittany Cowell. Rudi Helvig of Colorado Wine Country Tours says his company does a lot of bachelorette parties with the bride and her friends, touring local wineries with an experienced guide. Some local companies offer guided tasting tours via limousine or horse-drawn surrey. 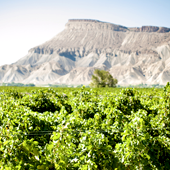 Here's a full list of wineries in the Grand Valley. Looking for a memorable outdoor wedding? Many locals and former residents choose the Colorado National Monument, located on the western edge of the city. This spectacular setting, reminiscent of the Grand Canyon, hosts about 30 weddings a year, according to Mark Davison, chief ranger. Anyone wishing to be married at the monument need only apply for a special event permit. Cost is $50 to $100, usually, depending on the number of guests. Most weddings at the monument tend to be small, but there is a picnic pavilion that can handle 150 if there’s a large group. There are no indoor facilities and no electricity to the site. Anyone planning to be married there should apply several months in advance, if possible. Of course, it’s impossible to predict weather that far out, so couples should have a backup plan, Davison suggests. To apply for a permit, go to the National Park Service’s website. For a wedding set in the mountains, look no further than Powderhorn Mountain Resort. Nestled in the Rocky Mountains, Powderhorn Mountain Resort offers breathtaking views and an unmatchable experience with the feel of a private resort for the bride and groom and their guests. Enjoy the intimacy of family and friends, surrounded by the beauty of the Grand Mesa. Powderhorn can host up to 200 of the wedding party's closest family and friends. Guests who arrive before or stay after the wedding itself have a broad range of diversions to enjoy. 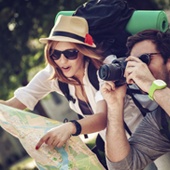 They can tour and hike the national monument, mountain bike for miles, do some wine-tasting at the many local vineyards, play golf, fish or raft on the Colorado River, even backpack or camp in the nearby Rocky Mountains. So Grand Junction not only is a great place for a wedding, it’s also a great place for a honeymoon!